The Kurdistan Region looks back to a long and rich history. After the collapse of the Ottoman Empire and the ensuing resistance to British rule, the Kurdish people of Iraq strived for recognition. Throughout the decades, the Kurds of Iraq fought for their basic rights, enduring oppression and persecution that culminated in the al-Anfal campaign and the chemical gas attack on the town of Halabja. In the last twenty years the Region has emerged from this past and has developed into a thriving multi-secular democracy. By clicking on the arrow, the entire history of the respective decade appears. 1910s With the occupation of Iraqi provinces by the British during World War I and the secret Sykes-Picot Agreement of 1916, partitioning the Ottoman Empire in British, French and Russian spheres of influence, the ‘Kurdish question’, the question of how the Kurdish population should be incorporated into the surrounding territories, emerged for the first time. When Woodrow Wilson introduced his 14 points in 1918, specifically referring to the importance of self-determination of all nationalities of the previous Ottoman Empire, Kurdish leaders began to hope that an independent Kurdish state would materialize. In 1918, Sheik Mahmoud (al-Hafeed) Barzinji, one of the most prominent Kurdish tribal leaders in the town of Sulaimani, was appointed by the British powers as representative for the area. While the British believed that the Kurdish population should be an integral part of a future Iraqi state, Barzinji and other important tribal leaders felt that Kurdistan should become a separate and independent state. After having had increased dissent between Barzinji and the British authorities, the sheikh was replaced. Inspired to fight British rule, Barzinji established his own Kurdish army and proclaimed himself as the king of a new Kingdom of Kurdistan in May 1919. However, within a month, the Kurdish revolt was defeated by the British, and Barzinji was sent into exile. 1920s To settle peace after World War I, the Treaty of Sèvres was signed between the Ottoman Empire and the Allied powers in 1920. Partitioning the Ottoman Empire, the treaty left room for an independent Kurdish state within the territory of today’s Turkey, with an option for Iraqi Kurds to join later. However, with Turkish nationalism rising under Mustafa Kemal Atatürk and his rejection of the Treaty of Sèvres, negotiations had to be restarted. In 1923, the Treaty of Lausanne was signed to replace the old treaty of 1920. The new agreement recognised Atatürk’s Turkish Republic but lacked the previous reference to an independent state for the Kurdish population. Instead, the Kurds were to be incorporated into Iraq, Iran, Syria and Turkey. Discontent with the partition of the Kurdish areas, the Turkish government argued for the incorporation of Iraqi Kurdistan into Turkish territory. However, due to the vast oil reserves in the Mosul area, the British were not willing to give up control over the territory. In 1925, a League of Nation Commission defined the border between Iraq and Turkey and allocated the predominantly Kurdish Mosul area to Iraq. In 1932, the British mandate ended when Iraq entered the League of Nations. Throughout the 1920s, the Kurdish struggle for autonomy continued. When Sheik Mahmoud Barzinji returned from exile, refusing to give up on the fight for independence, he soon took the lead in revolting against British forces and in 1922 once more declared himself king of the Kingdom of Kurdistan. However, by 1924, the Peshmerga, Kurdish fighters, were defeated by British troops and Barzinji again had to live in exile until he returned in 1930. 1930s After Barzinji had been defeated and sent into exile once more, Sheikh Ahmed Barzani initiated a new revolt and was soon joined by his younger brother Mustafa Barzani. Both came from the Barzani tribe in the Barzan area, the northernmost part of Iraqi Kurdistan, and soon commanded Peshmerga in their ongoing struggle for Kurdish autonomy, until Mustafa Barzani gradually took over the lead in the movement. 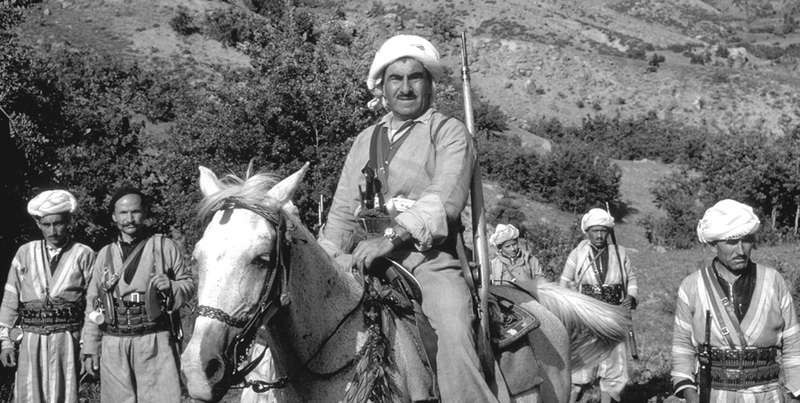 1940s During the 1940s Mustafa Barzani continued the fight for autonomy. In several battles, Barzani’s forces defeated the Iraqi army and increased control over the Kurdish areas of Iraq. Despite the increased pressure on Iraqi troops, Barzani’s negotiations for Kurdish autonomy and the release of imprisoned Peshmerga were not successful. When the Iraqi cabinet stepped down in 1944, the new government ultimately ended all ongoing negotiations with the Kurdish movement. The struggle for autonomy nevertheless continued under Mustafa Barzani as commander of the Kurdish forces. In 1945, the Rizgari Kurd (“Kurdish Freedom Party”) was established as an attempt to unify the various Kurdish tribes. A year later, the Kurdistan Democratic Party (KDP) developed from Rizgari and a second fraction called Hiwa, with the aim to promote autonomy for Iraqi Kurdistan. Mustafa Barzani was nominated as president in exile of the new KDP. At the same time, the Iranian Kurds under the guidance of Qazi Muhammad, leader of the Kurdistan Democratic Party of Iran (KDP-I), received assistance from the allied Soviet forces in their struggle for recognition within Iran. Together with Barzani, Qazi Muhammad managed to establish the Kurdish Republic of Mahabad in north-western Iran in 1946, an area occupied by the Allied powers during World War II. However, only few months after its founding, the Mahabad Republic collapsed following the withdrawal of Soviet troops from Iran. Qazi Muhammad and other leaders were executed while Barzani, his supporters and numerous Peshmerga went into exile in the Soviet Union. 1950s By the mid-1950s, the KDP was increasingly supporting the idea of a democratic republic instead of the Iraqi monarchy. When Abd al-Karim Qasim and his ‘Free Officers’ succeeded in overthrowing the Iraqi monarchy in 1958, the KDP supported the new government, hoping for an improvement of the Kurdish situation. Mustafa Barzani was invited to return from exile and supported the establishment of a new Iraq. Moreover, the new provisional constitution specifically referred to Kurds and Arabs as equal partners in the new Iraqi Republic. 1960s The 1960s were defined by a series of power transitions and political instability within Iraq. By 1961, increasing differences between Mustafa Barzani and Qasim resulted in the outbreak of the Kurdish-Iraqi War. Until 1963, Qasim’s troops engaged in heavy bombings of Kurdish villages to break the liberation movement. After Qasim was overthrown in 1963, the new pan-arabist government started negotiations with the Kurds for their autonomy rights. However, within nine months the new government was overthrown as well, with the two brothers Abdul Salam and Abdul Rahman Arif taking over. A phase of negotiations with, and military operations against, the Kurdish movement followed. When an Iraqi military campaign lasting from 1965 to 1966 failed, a 12-point peace program, offering elections, amnesty, reparations and limited self-administration, was presented to the Kurds. The peace program became obsolete after the Arif regime collapsed and a new Baath party regime, led by General Ahmed Hasan al-Bakr followed in 1968. Mustafa Barzani, keeping control of the Kurdish movement, continued to demand democracy for Iraq and autonomy for Kurdistan. With the rising conflict between Iran and Iraq, Iranian support to the Kurdish movement grew, and the pressure on Iraq to reach a solution with Barzani and the liberation movement increased. 1970s The ongoing pressure for Kurdish autonomy forced the Baath into new negotiations with Mustafa Barzani. In the aftermath of the First Kurdish-Iraqi War, Saddam Hussein, then vice-president of Iraq, met with Barzani to negotiate Kurdish demands. A special commission, consisting of Arabs as well as Kurds, was set up to determine the boundaries of a future autonomous Kurdistan. In March 1970 an agreement was signed. Within four years, the areas of Duhok, Erbil and Sulaimani were to be turned into a de-facto autonomous region under Kurdish rule. The right of Iraqi Kurds to participate in the federal government was to be recognized, and a quota of Kurdish representatives in high-ranking positions was to be introduced. It was admitted that the Iraqi people were made up of both Arab and Kurdish ethnicities. Consequently, Kurdish was to be recognized as the official language in areas with a Kurdish majority, and was to be taught in schools alongside Arabic. The right to create Kurdish youth, student, women and teacher associations was also affirmed. There was furthermore the promise to economically develop the autonomous Kurdish Region. Nevertheless, relations soon turned difficult again as the Iraqi government continued Arabization programs in disputed territories such as Kirkuk in spite of the 1970 agreement. An assassination attempt on Mustafa Barzani in September 1971 further aggravated the relationship between Baghdad and the Kurdish leaders. Attacks on Kurds continued and the implementation period expired. In March 1974, the Baath government unilaterally drafted a new proposal in a form of a law, the Autonomy Law, for autonomous Kurdistan. The Kurds had to either accept the one-sided proposal or face the consequences. The KDP under Barzani’s leadership rejected the proposal as it was formulated without Kurdish involvement and did not fulfil the concessions granted in 1970. This event marked the beginning of the second Kurdish-Iraqi war. With the support of the Shah of Iran, the Peshmerga were soon able to advance against the Iraqi army. To end Iran’s assistance to Kurdish efforts, the Iraqi regime offered control over the disputed Shatt al-Arab waterway to the Shah of Iran. In March 1975, the Algiers Agreement sealed this deal and Iran’s support to the Kurdish Peshmerga ended abruptly. Shortly after the agreement was signed, the Iraqi army managed to defeat the Kurdish movement. Mustafa Barzani and other Kurdish leaders were forced to go into exile and the Iraqi regime intensified Arabization programs, killing and displacing large numbers of the Kurdish population which resulted in a Kurdish refugee crisis. More than 200,000 Kurds, many of them civilians, were forced to flee to Iran. Due to the extreme living conditions in the overcrowded Iranian refugee camps and the lack of hope for an improvement of the situation, the international community decided to intervene. A program was created by several countries to give asylum to the Kurdish refugees. Austria was among these countries, taking in the first 100 Kurds from Iran. These refugees, mostly academics and students, reached Austria in March 1976. Despite these setbacks, the Kurdish liberation movement continued its fight for independence. With Mustafa Barzani in exile, the movement split in two fractions. Mustafa Barzani’s sons, Idris and Masoud, continued the struggle as leaders of the KDP, while Jalal Talabani split and formed the new Patriotic Union of Kurdistan (PUK) in 1976. 1980s In 1986, meetings between KDP and PUK were organised to reconcile the two Kurdish parties. These attempts proved to be successful: in 1987, the common Kurdistan Front, consisting of several Kurdish parties, was founded by Idris Barzani and Jalal Talabani. The fundament for a unified struggle for autonomy was created. With the outbreak of the Iran-Iraq War in 1980, history again took a turn against the Kurds. Saddam Hussein’s retaliation to Kurdish advances came in 1983, when the Iraqi army killed 8,000 men in the area of Barzan. The ‘Barzani disappearances’ were one of the first signs of an anti-Kurdish campaign, culminating in the genocide of the al-Anfal campaign which Ali Hasan al-Masjid, later infamously known as ‘Chemical Ali’, initiated. Chemical weapon attacks, deportations, arbitrary arrests and the destruction of entire villages killed close to 200,000 Kurds and forced millions to flee. The poison gas attack on the town of Halabja in March 1988 is to this day the largest single chemical weapons attack against a civilian population in history. 1990s With the end of the Gulf War in 1991, a new Kurdish uprising started. After Iraqi aircraft attacks on Kurdish villages and refugees close to the Iranian and Turkish borders, US, UK and French forces established ‘no-fly zones’ and a ‘safe haven’ to protect Kurds from further attacks of the Iraqi regime. Furthermore, the UN placed an embargo on Iraq. As a consequence, Iraqi forces retreated from Kurdish territories in October 1991. The Iraqi government withdrew administrative support and placed its own embargo on the Kurdish areas, cutting off food supplies among others. In 1992, the first elections deemed to be free, fair and democratic by international observers, such as Human Rights Watch, members of the Austrian and European parliament and foreign journalists, were held in the Kurdistan Region, finally establishing autonomy and the Kurdistan Regional Government. There were seven electoral lists contesting for the parliamentary seats. The two leading figures during the electoral campaign were Masoud Barzani for the Kurdistan Democratic Party (KDP) and Jalal Talabani for the Patriotic Union of Kurdistan (PUK). With their parties winning each approximately half of the votes, both parties agreed to power sharing. The remaining seats were allocated to members of the Iraqi Christian community. Voter turnout reached high levels, with Kurds from all areas including remote villages using their democratic right. These first parliamentary elections laid the foundation for further democratic developments in Kurdistan. The aftermath of the elections saw the creation of several institutions, such as the Kurdistan Regional Government and the formation of a National Assembly, the Kurdistan Parliament. From 1994, differences between KDP and PUK increased and ultimately lead to an inner Kurdish conflict. As a result, two separate administrations in Erbil and Sulaimani were founded. After four years of ongoing conflict, Masoud Barzani and Jalal Talabani, signed a peace agreement in Washington, which was facilitated by US mediators. 2000s KDP and PUK jointly organised their support for the US led Operation ‘Iraqi Freedom’ to topple the regime of Saddam Hussein in 2003, Peshmerga forces fighting successfully alongside the US army. The old republic was overthrown and a new constitution drafted, creating a new federal, democratic, pluralistic Republic of Iraq. The new constitution of Iraq, which was accepted by an overwhelming majority in a nation-wide referendum in October 2005, acknowledges the Kurdistan Region’s autonomy and the right of Kurds to participate in the federal government. In the national elections of Iraq in January 2005, an alliance of Kurdish political parties ranked second. Jalal Talabani was elected as interim President of Iraq and Masoud Barzani was nominated by the Kurdistan National Assembly to become president of the Kurdistan Region in June 2005. On 21 January 2006, the Kurdistan Democratic Party (KDP) and the Patriotic Union of Kurdistan (PUK) reached an agreement to overcome past differences and join hands to build a prosperous future for the Region. Signed by Masoud Barzani, President of the KDP, and Jalal Talabani, Secretary General of the PUK, the Agreement allowed for an equal distribution of government posts between the two major parties, while taking into account the Region’s smaller and minority parties. Furthermore, a new post of Vice President of the Region was created amending the Law of the Presidency. The Agreement also stipulated the leading role of the Region’s Parliament to name the Prime Minister and his Deputy. In all three governorates of the Kurdistan Region of Iraq, joint committees between the KDP and PUK were established in order to discuss and resolve eventually arising issues. Both sides successfully agreed to support Jalal Talabani as their candidate for the Iraqi federal presidential elections. In 2009, the third parliamentary elections were held and Masoud Barzani was for the first time elected by popular vote as President of the Kurdistan Region. Following the 2010 parliamentary elections in Iraq, debates about who should form the new government emerged between the dominant political parties. On the one side, the Iraqiya bloc under Iyad Allawi won most seats in parliament, while Nuri Kamal al-Maliki’s State of Law Bloc, originally second, later merged with another alliance, turning it into the biggest parliamentarian bloc. After nine months of dispute, the President of the Kurdistan Region, Masoud Barzani, mediated successfully between the factions in an attempt to solve the political deadlock. In November 2010, the Erbil Agreement was concluded by representatives of the various party blocs, including the Kurdistan Alliance, the National Alliance, and the Iraqiya bloc. The agreement called for power-sharing, granting representation to all political blocs and confirming Nuri Kamal al-Maliki as Prime Minister of Iraq.